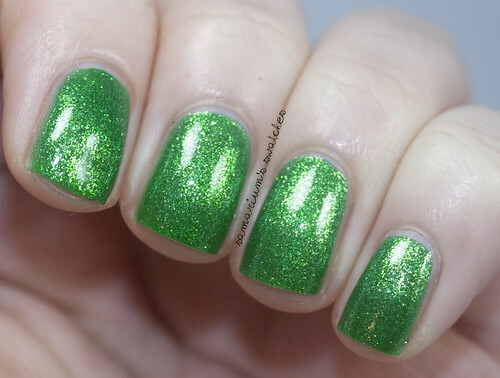 Laquerlicious Disgruntled Elf, Melted Ice Cream & Mixed Berries - Swatches & Review! Hello Lovelies! 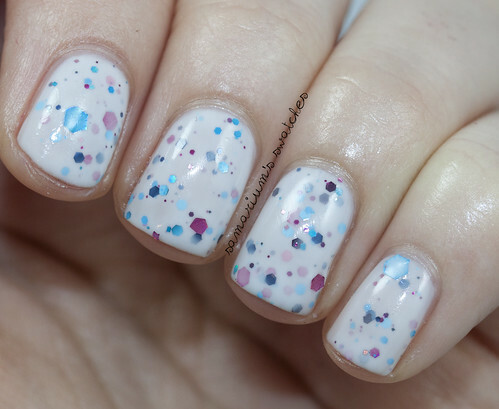 Today's post is of a relatively new indie polish brand called Laquerlicious! Disgruntled Elf, Melted Ice Cream, & Mixed Berries. 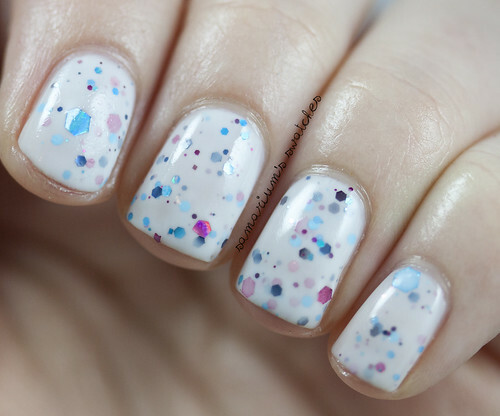 "a sheer silver base with red, pink, green, light green and white large to tiny square, hex and slice matte glitter." I layered Disgruntled Elf over China Glaze Running in Circles and Def Defying. Such a cute holiday polish, I think the added pink makes it more versatile then a only red and green Christmas polish. 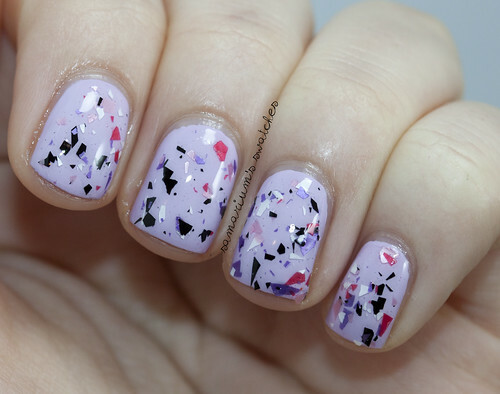 "a clear base with Black, White, Light Pink, Purple, and Hot Pink Shredded Matte Glitter. " I layered two coats of Melted Ice Cream over China Glaze Sweet Hook. 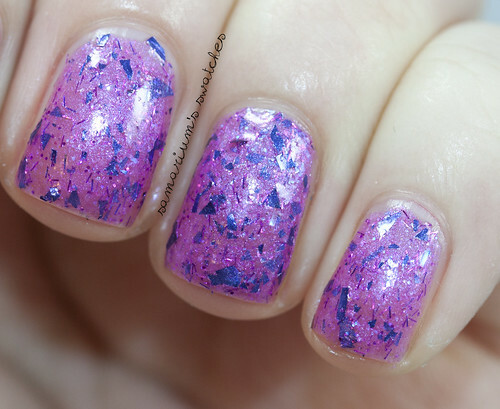 I recommend doing a bit of dabbing with this, it doesn't spread effortlessly but not many shredded glitter polishes do from my experience! Definitely worth the effort! Mixed Berries"a magenta with a blue shimmer jelly base. 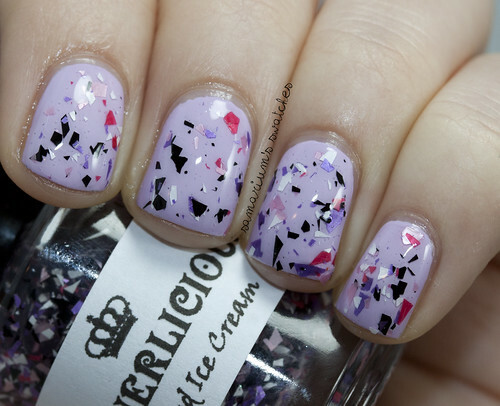 It has micro bar glitter and purple & silver shredded glitter." First I built up Mixed Berries on it own with three coats. 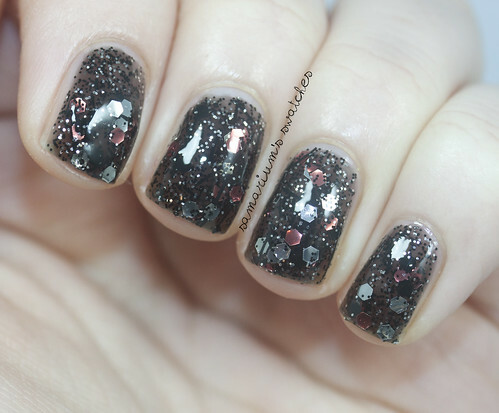 The formula is a little goopy due to the amount of glitters but applied very evenly. I prefer it layered like below though! 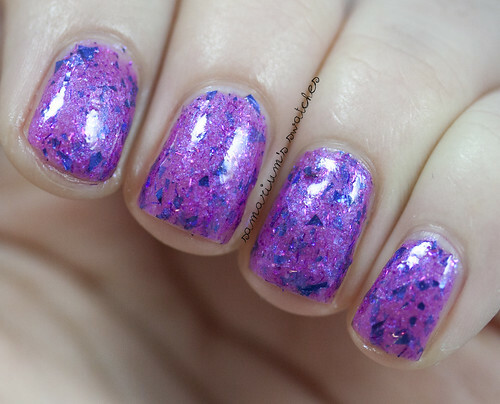 This is two coats of Mixed Berries over China Glaze Creative Fantasy. This polish is so gorgeous, I did my best to capture it but it is even more amazing in person! Here is Mixed Berries layered over China Glaze Hanging in the Balance, Cult Nails Time Traveler, Elf Fab Fuchsia, and China Glaze Creative Fantasy. Follow Michelle on Twitter, Facebook, and Instagram to stay updated! She also offers minis for $5.00. 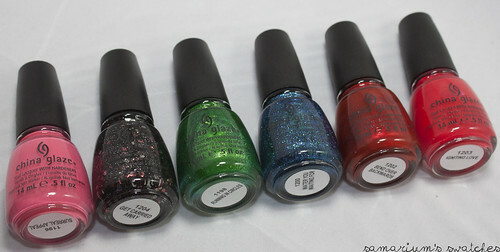 BUT all three of these polishes are on sale right now! They are available for $6.50 each, when they sell out they will be gone forever so if you want any of these jump on it ASAP! I highly recommend them, especially Mixed Berries!! 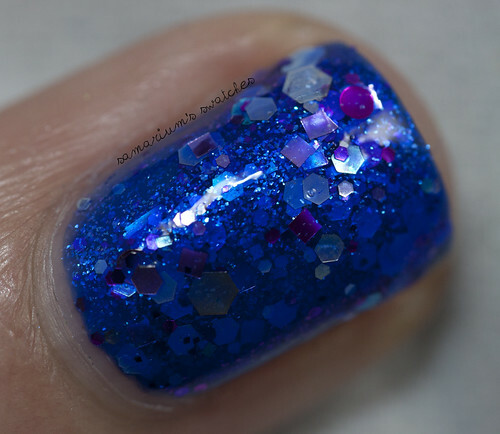 Michelle is making some truly gorgeous polishes, seriously go check her out! 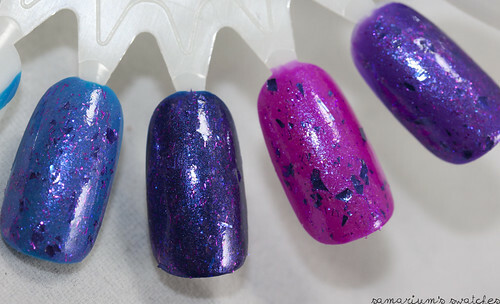 Jindie Nails Burrrberry, Battle Royale & Honey Blue Blue - Swatches & Review! Hey guys! Today (well more like tonight!) 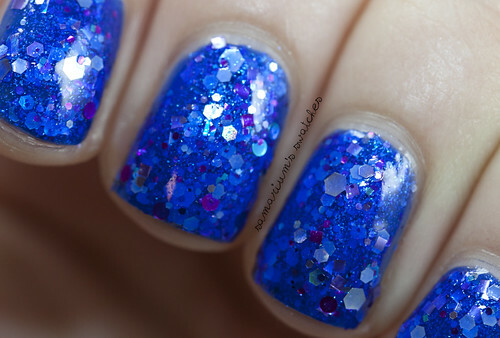 I am posting about more amazing Jindie Nails polishes! I planned to do it tomorrow but she restocked tonight so I figured the sooner the better! "a white cream/jelly "crelly" base with several sizes of glitters in all the berry colors including blue berries, magenta, strawberry, raspberry, blackberry (wine colored) glitters." I used three thin coats for full opacity. This is the perfect winter crelly! The formula was a dream, I honestly think Jen makes some of the best (if not the best) crelly's on the market. 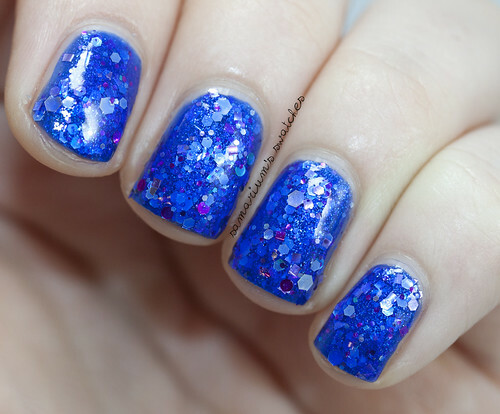 "a beautiful royal blue jelly polish with color shifting shimmer that shifts from blue to purple to pink. It has turquoise, magenta, silver, deep purple, violet, lavender, periwinkle metallic and holo glitters and light pink, turquoise and magenta rare round dot metallic glitters throughout." I honestly cannot express how much I love this polish! I used three coats. Application was awesome, even with the sheer amount of glitter in this! 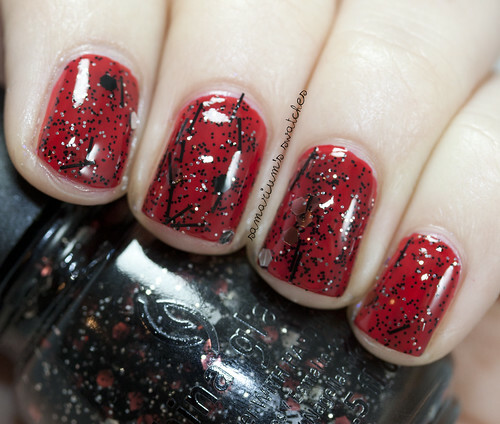 You WILL be seeing it on my top polishes of 2012, when I finally get around to posting it! I think i did good capturing it, but it is even more beautiful in person, simply and utterly stunning. 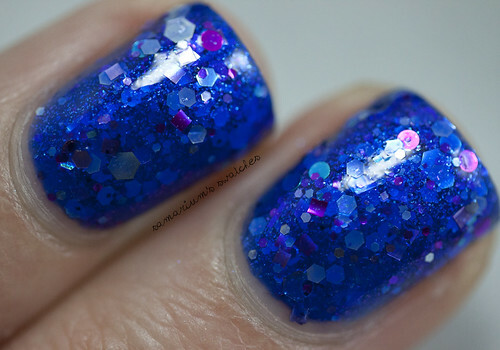 If you love blues, jellies and glitter - Buy it. 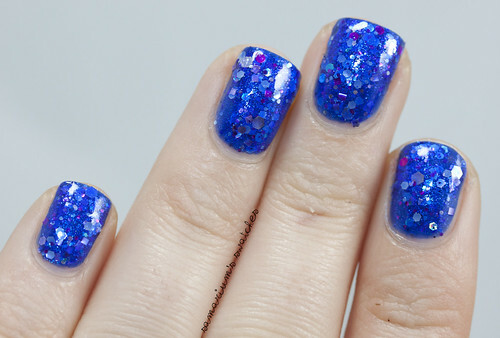 Seriously, this *might* even be my favorite polish of the year. 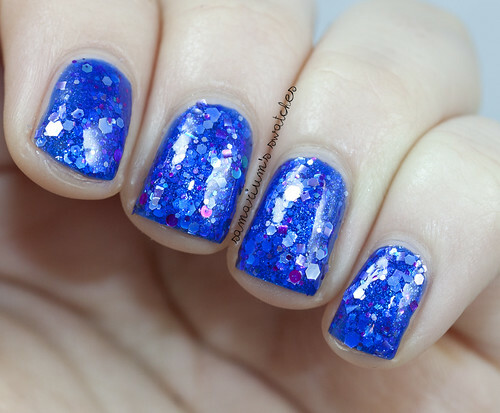 "a medium blue cream/jelly "crelly" base with several sizes of royal blue and emerald green holo hex glitters." I believe I used three thin coats for opacity. While I have never seen the show this is named after I love it! 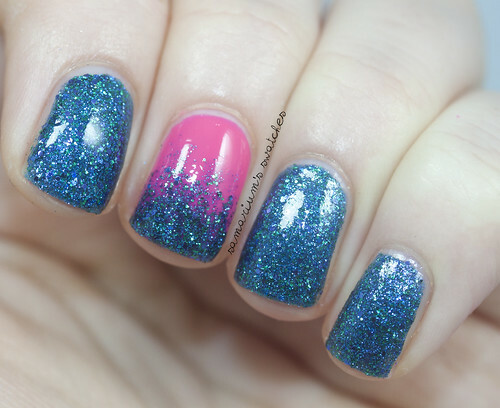 Perfect mix of glitters with the crelly base, application was wonderful like all of Jen's crellys! The Jindie Nails Etsy shop JUST restocked tonight so get them while you can! If you haven't tried Jen's polishes yet I urge you to! I wish I had sooner! Follow her on Twitter, Facebook, and Instagram for sneak peeks on new polishes and to stay updated! 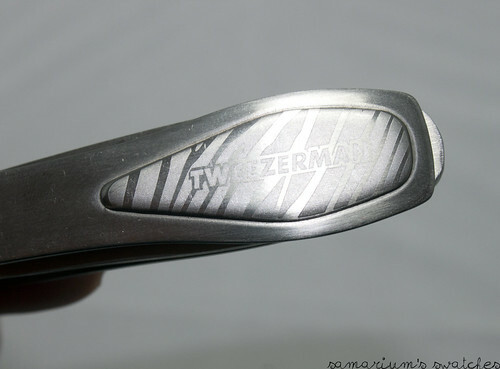 Today's post is about the Tweezerman Ambassador Program! I saw a few bloggers post about this and I was super intrigued so I applied! To learn more about the Ambassador program or to apply click here. The Tools arrived in this nice roll up case, so fancy! My light box wasn't quite big enough to capture the case fully, but you get the gist! "Features an ingrown file to help relieve the pressure of ingrown nails and a thin, curved end to clean under and around the nail." This is something I have come to love so much! I use the cleaner almost every day and very much prefer it to the cleaner on the Pushy. I've never been one who gets ingrown toe nails but it is nice to have just encase. The weight on this is crazy, you can clearly tell this is a quality made product. "Our stainless steel Pushy has thin, hand buffed edges for pushing back cuticles and cleaning under and around the nail without scratching." Out of the three cuticle pushers I own now these are my favorite, but I still feel that the $17 price tag is a bit steep, but it is well made and works well. "Our Award Winning premium nipper with ultra-sharp hand-finished tips and smooth double spring action delivers the ultimate in precision and performance. Withstands repeated sterilization without rusting or corroding. Stainless Steel. Lap Joint. Available in 1/4 (small) 1/2 (medium) and full jaw sizes." but they are fantastic for hangnails! They are very sharp. these along with the Tweezerman Zebra etched nippers are the smoothest ones I have ever used. I can clearly tell they are superior quality to all the others I have previously used. "The sturdy design is reinforced by its rock-hard, stainless steel construction and features sharp, long-lasting snipping tips for smooth cutting action." Same as the Cobalt nippers these are smooth and very sharp, but I use them less often because the nipper size is larger. Amazing quality though. 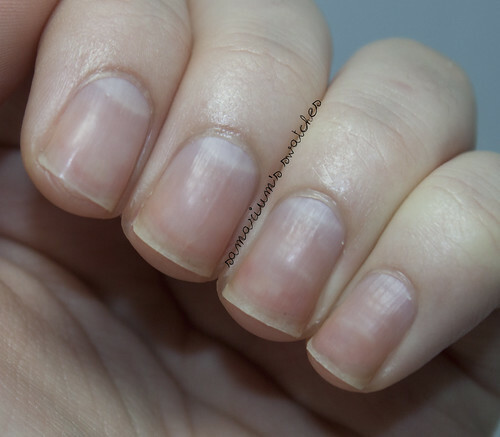 "Transform untidy, tattered or shabby nails into a perfectly pampered, lovingly trimmed look. 100% sanitizable." I truly think everybody, or at least girl should buy these toe nail clippers! I love the straight edge so much, and they clip so smoothly. They are very sharp, and also very cute. "Pack of 5 thin wood files. Ultra durable." This was my first experience trying a wood file and I was quite impressed. I prefer softer files for shaping but this is great to take away some length and to get a nice squared shape. 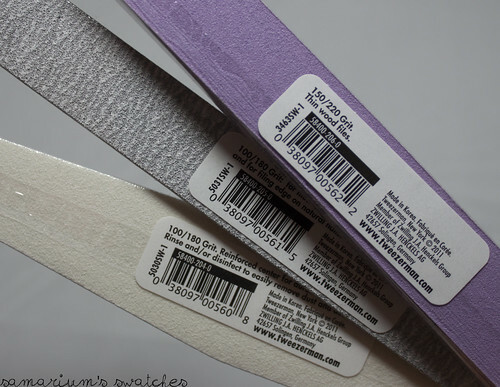 "100% biodegradable and 100/180 grit for medium sanding on acrylic nails as well as for filing edges on natural nails." This is a nice thick quality file, but I prefer to use one with a higher grit on my nails so I don't grab for this one often. It is great for my toe nails as they are much thicker and stronger. I love that is is eco friendly and biodegradable. "Washable, sanitize-able and durable with 100/180 grit and a reinforced center for added strength." Like the Eco Friendly file, this grit is lower than I prefer to use since my nails aren't the strongest. I use the 180 grit side but not the 100 grit one. I love the shape of this file, I find that the extra width makes it more comfortable for me to hold. I hope they make higher grits available in the future. Very thick and sturdy file. 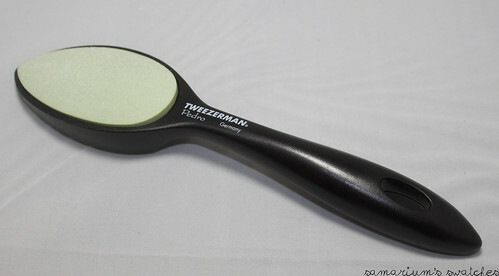 "Superior quality two-sided ceramic stone with a rough side for reducing calluses and a fine side for smoothing skin. Strong, sturdy handle for optimum control. Washable." I kind of want to write a love letter to this Pedro Callus Stone. Where have you been all of my life? I have tossed around the idea of purchasing this stone many times, but the price always ran me away. I regret being cheap and not purchasing this! I've tried many pumice stones but none were ever a perfect fit for me. I'm not sure how to explain it, but they would make a difference for the night but not long term. This stone actually feels like it is continuously making a difference for me. I worried that it would be too rough because it felt a little scary but it is perfect! I was tempted to do a before and after but I know a lot of people hate feet so I decided against it. Here is a photo of my nails in pretty awful shape. This was taken the day we moved into our new place. I wasn't moisturizing as much as usual and had to move furniture and broke two of my nails. Here is the "After" picture. I used the files, nippers on hang nails, and pushed my cuticles back. 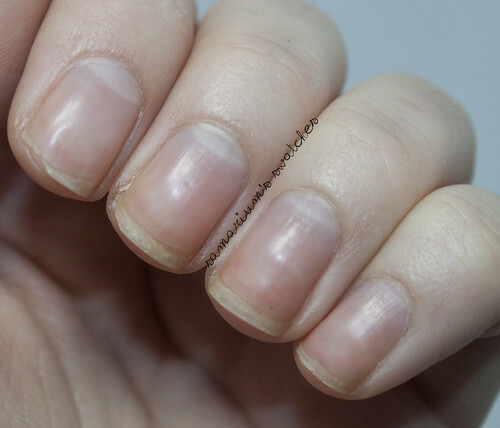 My cuticles actually look worse here to me but that is because I typically use a cuticle trimmer after I push them, but I didn't here because there wasn't one included in this kit. 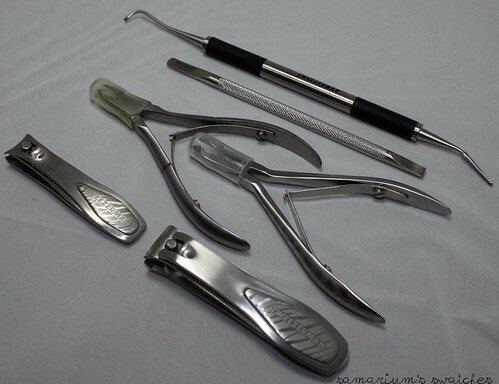 Not that I wasn't already aware, but this kit just proved to me even more so that Tweezerman makes wonderful high quality products. 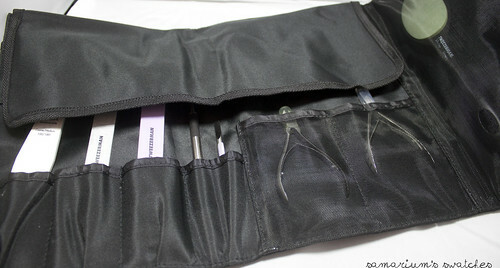 I love their tweezers so much and I'm thrilled I finally got the opportunity to try their manicure and pedicure tools! The only way this kit would be more perfect to me would be if it included a Cuticle Trimmer. I have heard they make them, but I haven't been able to find one. 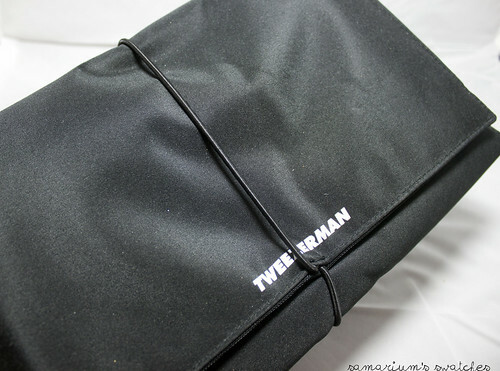 To stay updated with Tweezerman follow them on Facebook and Twitter! and that you all have a fantastic weekend! Good [insert your time of day here] Everybody! Surreal Appeal, Get Carried Away, Running in Circles, Water You Waiting For?, Bend Over Backwards, Igniting Love. I used two coats above. This polish is pretty and even though it doesn't seem very unique I don't have a dupe in my stash. I can't remember how great the formula is but I definitely don't remember it being bad. When that usually happens I swatch it on a nail wheel or one nail but I think my daughter hid this one >.< Can't find it anywhere! The formula on BOB was perfect! I used three coats for opacity, and sponged some over Surreal Appeal for an accent. This is my second favorite of these six, gorgeous! Application is easy, but definitely apply two coats of topcoat. One coat seems fine and smooth, but when I woke up in the morning it was like it drank it all! Lovely green! I used three coats above. 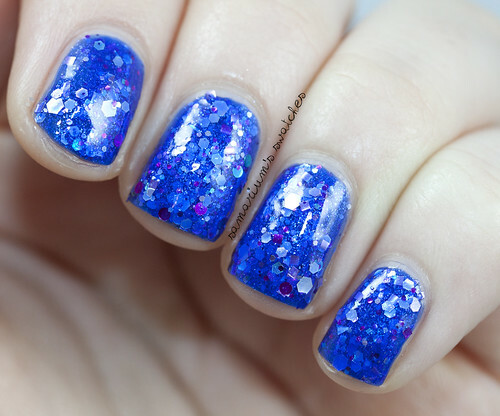 Reminds me of the glassflecks Zoya is famous for. If I could only buy one out of these six-this would be it. Stunning. The formula was very easy to apply, a tad thin but not runny. 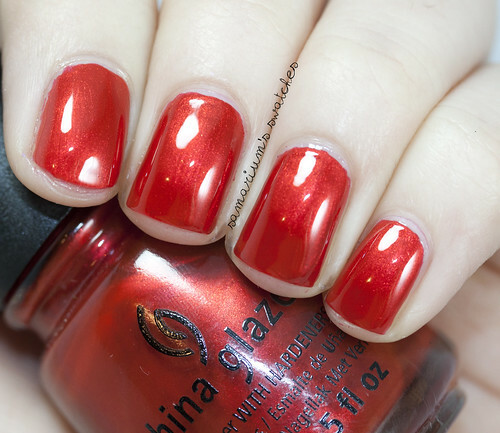 I used 1.5 coats over Igniting Love. But you can wear this alone with three coats. It may be better to dab this on, the glitter didn't disperse how I'd like it to by just wiping it on. The formula was nice and smooth. I used two coats for opacity. Formula was good, not amazing but easy to apply. 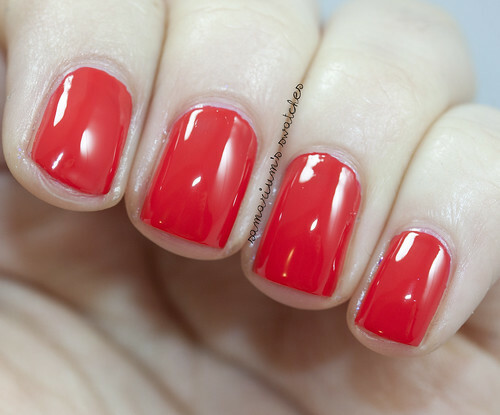 I usually don't like corals but I love this on me. If you can't buy them all but want this look for cheaper, this looks very close to Wet n Wild Dreamy Poppy. 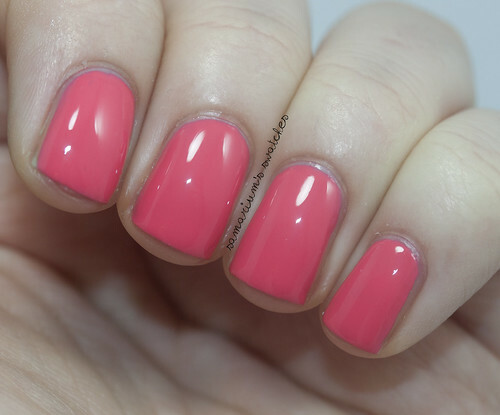 DP is a little more salmon and SA is a bit more coral but similar shades for sure! 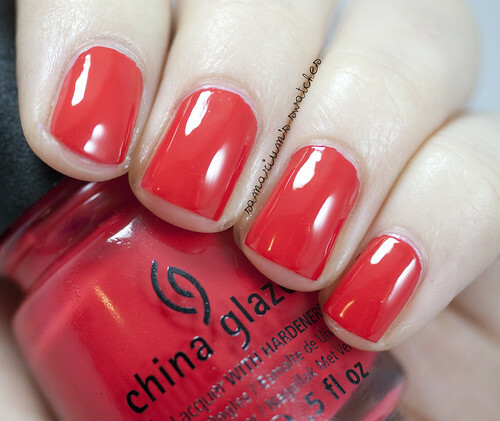 Follow China Glaze on Facebook, Twitter and Instagram!